A Year of Being Here: Dolores Stewart: "Outside"
"Outside" by Dolores Stewart, from The Nature of Things. © Bellowing Ark Press, 2011. 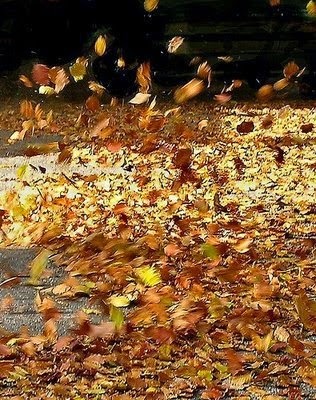 Art credit: "Swirling Leaves," photograph by the Clonmel Garden Centre. I love the image of that breeze as the invisible dancer, a skirt of leaves swirling, and recognize to the habit of sitting in the car sometimes just to watch what is going on in the world. And that note, how wonderful that would be . . . that the people in charge of church would abandon the building to dance in the wind and the leaves! Joy for all!